hario ceramic slim, originally uploaded by super eggplant. 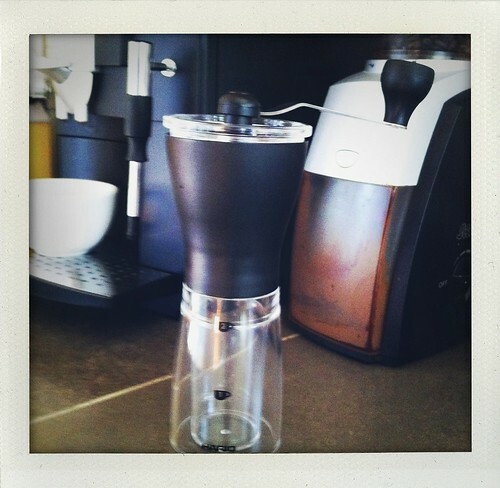 I am not overly obsessive about my coffee, but I do have a thing for coffee gadgets. I have a small collection of coffee-related items, including the Aero Press, the Clever Coffee Dripper, one of those toddy things, and so on. I also have a burr grinder that I love, but ever since I saw these Hario Ceramic Slim Coffee Grinders, well, I’ve been wanting one. I didn’t really have a good reason to purchase one, though, until now–this summer we’re going to go sailing in the San Juans, and of course we will need freshly ground coffee. I am in charge of provisions, and the Ceramic Slim was our first official purchase. So, I may be throwing up over the side of the boat, but at least I, or my companions, will have good coffee. first Hawaii, now a sailing trip. It’s like you’re TRYING to hurt me. I bought the Clever Dripper for myself after Christmas as a present to myself and I love it. I suggested it to my friend who doesn’t drink coffee herself so her mom can drink something other than Sanka when she visits and it has been a hit there too! If I decide to grind my own beans again I will be coming back here for a look see. That sounds like a FANTASTIC trip. I visited a friend who was doing research in San Juan for several days and it is so peaceful. My uncle gave us a set of insulated ceramic travel mugs/cups and they’re fab. I never drink through the silicone lid, though, since they smell funny sometimes. The mugs really help in keeping tea (would also assume coffee) at a better temp without that over-scorching metal thermoses have and quick cooling that plastic is prone to. Maybe you should add a zester plane for fresh ginger. Preventative ginger helps with sea sickness and I take it in pill form when I know I’ll be hitting choppy water. It also helps “heat” the blood so maybe the damp and chilly winds will get to you less. Besides, you could use it for other stuff. Like maybe a little cinnamon on top of that coffee. sailing in the san juans… how dreamy!!! and fresh ground coffee too??? paradise! !